Gullar and Aleixo exemplify a shift in poetic approaches to sound between the twentieth and twenty-first centuries that Brian M. Reed aptly describes. Whereas in the twentieth century, both poets and critics perseverated on the question, “What is the medium of poetry?,” in the media-rich twenty-first century a new challenge arises: “What can this medium do for poetry?” (270, 284). “Barulho,” with its lyric comparison of poetic material to the materials of other arts, takes up the first question. Aleixo, who has steadily increased his media platform over the last two decades, poses the second. One response to it is that his own sonic media blend produces a freedom that responds to yet another question, that of race in Brazil. Aleixo’s work sounds the issues of racism and racial identity, specifically black identity, in a country that historically has remained silent on these subjects. 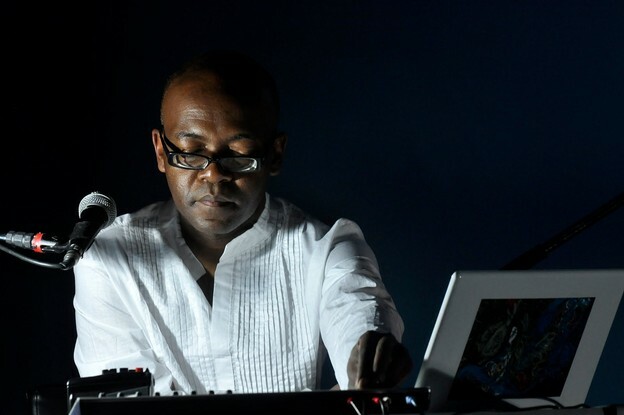 Through his own performing body, sonic, verbal, visual, and rhetorical devices, and the incorporation of forms and sounds from Afro-Brazilian ritual, poetry, and music, his work continually acknowledges blackness and African heritage, and often points to the power structures within which race functions in Brazilian society. This active exchange differentiates Aleixo from Gullar and from the Brazilian poetic vanguard in general. The poetic engagement of race is part of a broader issue of identity and freedom. “Um Ano Entre Os Humanos”—both the performance and the poem of that title in Modelos Vivos (2010)—poses the fundamental question, What does it mean to be human? Its answer: Humans make noise. Like Gullar, Aleixo’s expansive use of poetic sound effects signals personal artistic freedom. As Edimilson de Almeida Pereira has recently pointed out, artistic freedom is one of the most powerful forms for social intervention. In an August 2010 performance of “Boca também toca tambor” (“the mouth also drums”), a one-and-a-half minute segment of the roughly forty-minute “leitura-concerto” (“reading/concert”), Música para modelos vivos movidos a moedas (2010), Aleixo plays with the valuation of time that usually gives form to music and language. He fluidly sounds out the words boca também toca tambor in different pitches that invoke African-based drumming tones. As he repeats the short line, altering the pitches, a delay in turn repeats his successive intonations. The repetition, like a round, is a musical loop that alters with each cycle, breaking the linearity of time. Concurrently, Aleixo’s fluctuating pitches disrupt the rhyme of boca / toca, and the repeated words begin to sound layered. Both the looping and the pitch changes lend spatiality to the words, as their sounds bounce around the room and layer upon each other. An audience can perceive the bouncing audio-visually: Aleixo talks in one spot, and the sound moves to another spot. The performance amplifies the spatial dimension of the words over and above the temporal dimension. In effect, the words break loose from linear time. Looping reveals some flexibility to time, but it also suggests digital perfection. Two identical videos projected on a wall behind Aleixo reinforce this theme. Aleixo’s fluctuating pitches prevent the loop effect from seeming perfect. They alternate between drum tones and register ups and downs in energy and volume; at several moments, his voice rises sharply in tone, like a record speeding up. Human imperfection enters the backdrop, too, when a third video, manipulated by another performer, momentarily descends to cover the two perfect copies, then retreats off to the side. The combination of musical sound and the raw energy of live performance underline the human dimension to the space-time dyad, suggesting human freedom in those freewheeling sounds and words. The continually layering, bouncing sounds of “Boca” exceed the limits of time. The idea of excess reappears in the visual poem “Solo” in Modelos Vivos, which is constructed from the same four words (fig. 1). A square of five lines with five characters per line (four letters plus spaces), “Solo” resembles a solid Concrete object. The words, however, extend beyond the frame. This visual excess mirrors the aural excess in “Boca.” The poem’s round words resist their straight borders just as Aleixo’s voice exerts energy against the square room, resisting the trap of the four repeating words. Busting at the seams and bouncing against the walls, the poem exceeds the bounds set by Concrete poetry. Figure 1. Ricardo Aleixo, "Solo." © Ricardo Aleixo. Reproduced by permission of the artist. The title “Solo,” of course, suggests a musical score, and to an extent, the poem is a silent arrangement of signs to be sounded, with letters indicating notes, and spaces indicating pause or rhythm. The arrangement of the words—broken up, enjambed, curiously spaced, with letters running into each other and exceeding the frame—interrupts the rhyme of boca / toca and the visual semblance of também / tambor. But “Solo” also has its own sound. The unusual line breaks, besides serving to create a square, produce the syllables to / ca / ta. Resonant of staccato, the phonemes give rhythm to the page. The demands of the square also create new sounds to read or perform: tamb, em to, ca ta, mbor. These strange words necessitate improvisation; no two performances of them will be alike. The “Solo” score thus calls for its own exceeding. “Solo”/“Boca” exceeds the terms of previous poetic movements and creates a wide notion of freedom that at once advances both individual artistic freedom and broader social liberation. Its transmedia basis breaks out of poetry’s static printed convention, and the texts’ nonlinear interaction with each other upsets the traditional relationship between musical score or written poem and performance. “Solo” literally exceeds the terms of the Concrete poem as its words bleed beyond the boundaries of the delimited, constrained poetic object—a gesture echoed by the vocal effects of “Boca.” Because “Solo” both occupies a fixed state on the page and, running out of bounds, is a poem in motion, it also exceeds the Neo-Concrete idea of poetry, which involves the reader to achieve a closed cycle. Instead, the reader interacts with a text that is continuously out of range, yet must be pursued. Moving beyond Gullar’s relational print verse into the territory of page plus live performance, where the range of sound is at its most extensive, the work’s ethical imperative comes into full dimension. The making of poems that are “obras permanentamente em obras” (“works permanently under construction”) and the performance of freedom call for complex and diverse participation, to hear a full and ever-changing chorus of barulhos in all their resonances and difference (Modelos Vivos 92). 11. “Cross-platform” is Brian M. Reed’s term for twenty-first century poets who produce and distribute their work “using a range of different means of communication” and thus “define a poem less as a one-off artwork…than as a cluster of related works in different media” (282). A given poem of Aleixo’s might exist in any combination of live performance, online recording, exhibit, and book. Like the Europe- and North America-based poets Reed discusses, Aleixo “explore[s] how a work might unfold differently under different conditions” (282). 12. In 2006, Aleixo proposed a term for his hybrid literary practice: text-jockey[ing]. Building on the DJ, VJ, and WJ (web-jockey), the TJ “opens new creative paths through the exploration, in real time, of the voice/text relationship.” (“À semelhança do DJ (disc-jockey), que manipula discos, do VJ (vídeo ou visual jockey), que reconfigura imagens e do WJ (web-jockey), que reorganiza imagens e sons apropriados da Internet, propõe-se o conceito de TJ (text-jockey) para designar um tipo de artista para o qual novos caminhos criativos se abrem a partir da exploração, em tempo real, da relação voz/textos” (“Arquivox”).) The TJ understands “text” in a broad sense, and privileges its change and interrogation through the medium of voice. 13. Música para modelos vivos movidos a moedas premiered in July 2010, preceeding Modelos Vivos by a few weeks. The performance includes thirty poems from the book, three videos, and sound generated in a range of media. 14. Though Aleixo is highly aware of pitch, this piece does not broach high and quiet or low and loud vocalizations, which are harder to do with the human voice. 15. Aleixo’s graphic, indeterminate score recalls scores by John Cage, one of his main inspirations. Aleixo, Ricardo. “Arquivox: práticas vocais nas poéticas contemporâneas.” 38º Festival de Inverno da UFMG. Universidade Federal de Minas Gerais, July 2006. 14 May 2007. ---. Boca também toca tambor. Galeria Municipal de Arte, Itajaí, Santa Catarina, Brazil. 9 Aug. 2010. akavulgo’s Channel. Ricardo Aleixo. YouTube, 30 Aug. 2010. 8 Aug. 2011. ---. Modelos vivos. Belo Horizonte: Crisálida, 2010. ---. “Música para modelos vivos movidos a moedas.” Jaguadarte – Posse de Ricardo Aleixo. Blogspot, 13 July 2010. 23 Aug. 2011. Pereira, Edimilson de Almeida, ed. Um tigre na floresta de signos: estudos sobre poesia e demandas sociais no Brasil. Belo Horizonte: Mazza Edições, 2010. Perloff, Marjorie, and Craig Dworkin, eds. The Sound of Poetry/The Poetry of Sound. Chicago: U of Chicago P, 2009.